This devices measures electrical continuity, signaling resistance values bellow 100 Ohm with LED light feedback on the mobile probe (pin), as well as a high beep. Resistance values above 100 Ohm do not trigger the LED light, but are audible as lower frequencies. The second probe can optionaly be hooked to fabric for hands-free use. 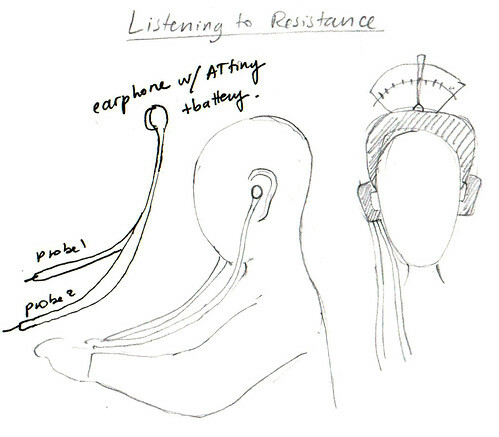 A question to answer through testing this device through use is whether one can learn to differentiate the different resistance ranges through their audible frequencies.